Swiss watchmaker Rado has pleased its fans with a novelty DiaMaster RHW1 Limited Edition, created from innovative materials. The watch is made in the laconic style. The material Si3N4 TiN, which is a type of high-tech composite ceramics, the weight of which is two times less than conventional ceramics, is used for the manufacture of the novelty. This material is generated by heating the silicon powder at a temperature of 1800 ˚C under high pressure in a nitrogen environment, and has high durability. The novelty DiaMaster RHW1 Limited Edition is equipped by a black dial with large roman numerals 12, 3 and 6, hour indexes, sub-dials with a second’s hand, and the two central hands to indicate the hours and minutes. The Rado’s logo adorns the dial at the 3 o’clock position. The watch comes on a black leather strap. The novelty operates on the base of an exclusive mechanism RHW1, for the manufacture of which the brand’s masters are inspired by the aluminum mechanisms, known for their ease and used for pocket watches in the late 19th and early 20th centuries. On March 19 this year, the presentation of Rado held, on which the actress, screenwriter and director Renata Litvinova officially introduced a new model Rado eSenza Ceramic Touch, which was the main theme of her art project "Touch the time". At the upcoming watches and jewelry BaselWorld 2014, the watch company Rado will present its amazing novelty Esenza Ceramic Touch Fibonacci Diamonds Limited Edition. The new HyperChrome Automatic Chronograph Plasma Ceramic (Ref. 650.0276.3.010) watch by the Swiss watchmaker Rado has a case representing a gray cast monoblock ceramic metal bracelet with a length of 51 mm, a width of 41.8 mm and a thickness of 13 mm. The second consecutive year, the watchmaker Rado has become the official timekeeper of the 24th International Tournament "Bank of Moscow. Kremlin Cup". The tournament was held from 12 to 20 October in the sports complex "Olympic". The second consecutive year the watch brand Rado has become the official timekeeper of the "Bank of Moscow Kremlin Cup. The actress and director Renata Litvinova, the messenger of the watch company Rado, was the heroine of a new Rado advertising campaign. The well-known presenter, actress and style icon, Lisa Ray participated in the celebration of Rado, who passed on July 18 in Toronto. The messenger of the watch company Rado, Canadian actress Lisa Ray has participated in the celebrations held in the cities of India: Bangalore, Chennai, Kolkata and Jaipur. Andy Murray - a British tennis player, the second missile world, the ambassador of the watch company Rado, won the Royal Club Aegon Championships in London. During the Cup presentation, Rado adorned the athlete’s wrist with the model HyperChrome Automatic Chronograph. Swiss watchmaker Rado has released a novelty HyperChrome UTC, which has a ceramic case with a diameter of 42 mm and a thickness of 10.8 mm. The watch water resistant - 100 meters. During the premiere of the film "The Past" on the red carpet at the Cannes film festival, the known actress Renata Litvinova appeared in a long white dress, and the actress’s wrist was graced by the watch Rado HyperChrome Glam Slam of white ceramic, decorated with 181 diamonds. Andy Murray is a British tennis player. He started playing tennis at the age of three. Andy is the first Briton since the beginning of the Open era, who managed to win a Grand Slam title in the men's singles - U.S. Open 2012. In March 1, 2013, in GUM an exhibition of the famous watch brand Rado was held. At the exhibition was presented the Rado HyperChrome collection - the world's first model with a monolithic case made of high-tech ceramics. The famous Swiss watchmaker Rado has released a novelty D-Star Ceramic Chronograph, which will be officially presented at the annual exhibition BaselWorld 2013. The presentation of the Rado HyperChrome collection held in the Indian city of Mumbai, January 29. The sudden appearance on the roof terrace the Bollywood actor and the ambassador of the company Rado Hrithik Roshan heighten an exciting atmosphere of the gala evening. 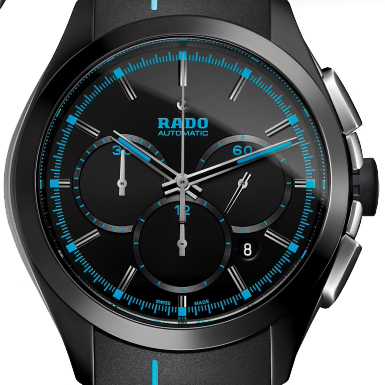 The company Rado has released a new model Rado D-Star Rattrapante Limited Edition in 2013. Recently, the Rado D-Star collection of the watch brand Rado has been updated with four novelties. These are automatic chronographs in cases made of ceramic in black or platinum shades. The famous Swiss watchmaker Rado presents the new version of the DiaStar 1 watch, issued in 1962. This model was known on the watch market with its scratch resistant, thanks to the case material. It is made of titanium and tungsten carbide. From 13 to 21 October this year, the famous watch brand Rado has become an official partner of the two tennis tournaments - Erste Bank Open Vienna 2012 in Austria and the "Bank of Moscow Kremlin Cup" in Russia. Swiss watchmaker Rado has acted as the official timekeeper of 23 Kremlin Cup, held from 13 to 21 October in the sports complex "Olympic". Swiss company Rado has introduced in 2012 a new watch model D-Star Plasma. In 2012 the Swiss watch company Rado has announced its new partnership: the company now will be the official timekeeper of the Kremlin Tennis Cup which will be held in Moscow from 13 to 21 October. Among the general trend, evident in much of the majority of watch companies producing mainly diver's watch (with a hint of summer vacation), and watch with an unobtrusive, lightweight, and, why not, fun and lively design, a novelty of Rado stands aloof. Another novelty of the summer season 2012 is represented by Rado, presented a monochrome watch from the D-Star collection - the first watch of monochrome colors in this collection. One of the most famous tennis players of the modern sport, which occupies the fourth place in the world and the first British tennis player Andy Murray has become the official ambassador of the watch company Rado. Swiss watchmaker Rado, which enjoys great popularity around the world, announces the release of limited edition models in a series of R-One. In Dubai, February 9, 2012 the world premiere of HyperChrome collection by watch company Rado was held. The event was attended by 260 guests from 51 countries in the world. The watch company Rado introduces new diver's watches D-Star 200 Automatic and D-Star 200 Automatic CHRONO. They are Swiss watches, created specifically for diving. Both models have a slightly elongated oval case, which makes the design of a special nature. Famous for its experiments with high-tech ceramics the company Rado has released a new ultra-thin watch True Thinline, who received the "status" of the finest watch in hi-tech ceramics. The new masterpiece set the new standards in watchmaking. The weight of watch is only 38 grams with the case thickness of 4.9 mm. In turn, the thickness of the mechanism is only 1 mm.